In this multiple portrait I explore the New Jim Crow, Orange is the New Black and other 21st century disfunctions and broken covenants, with references to 19th century allegory and studio portrait photography. 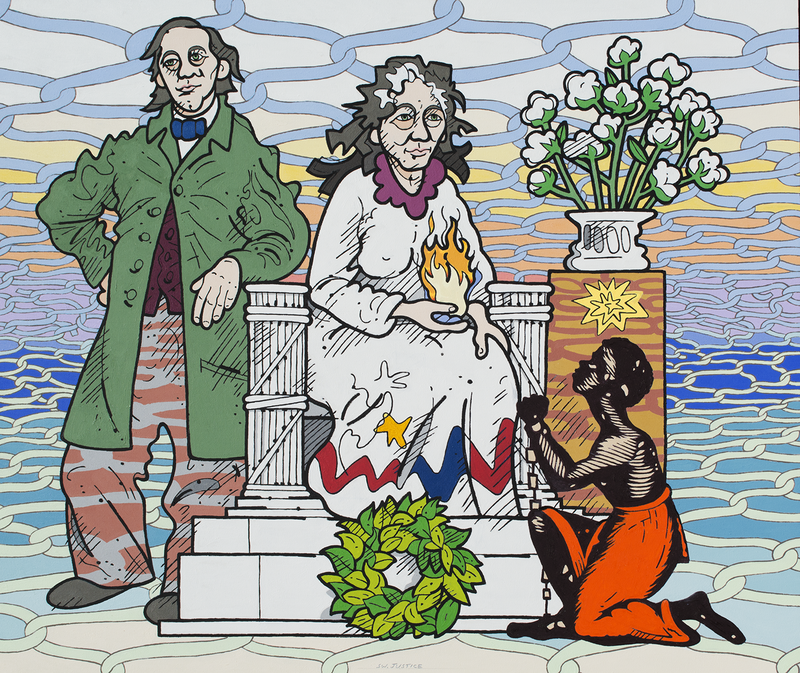 A character from a block-printed slave poster, with the pole-star and a bouquet of cotton still over his head, appeals for freedom to the two celebrity abolitionists and public intellectuals, as Harriet Beecher Stowe sits in Lincoln’s Memorial chair and Henry Ward Beecher dreamily ponders his next lecture. A chain-link fence, a tool that is alternately employed to keep people inside some things and outside of others, plays the part of sea and sky, seen here creating negative space above and positive space below. (Charles Barnard of England invented the chain-link fence in 1844.) The airy cloisterishness at the top of the painting describes the feeling one in meditation feels when energy fills the brain, pure and unembellished by the senses. Lincoln’s seat is marble, though you may take it for granite. My rendering of Harriet’s hair is no mistake – hers has to be the worst ever. I finally used as a model a porcupine I trapped in the woods, using satire and sardonic wit as bait.